Exploring Santorini. This year I decided to go back to one of the places I love the most, the island of Santorini. I needed to shoot some projects so I flew to Greece and spent 3 days in the village of Oia, up and down its blue domes, its windmills and its thousand steps. 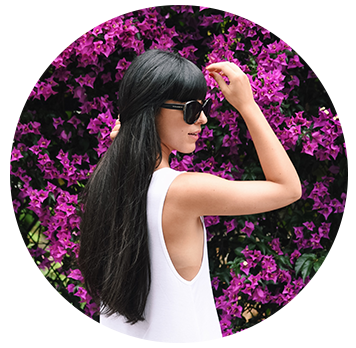 Today I am telling you everything about this trip, also trying to answer the main questions I’ve received on my Instagram @lauracomolli! 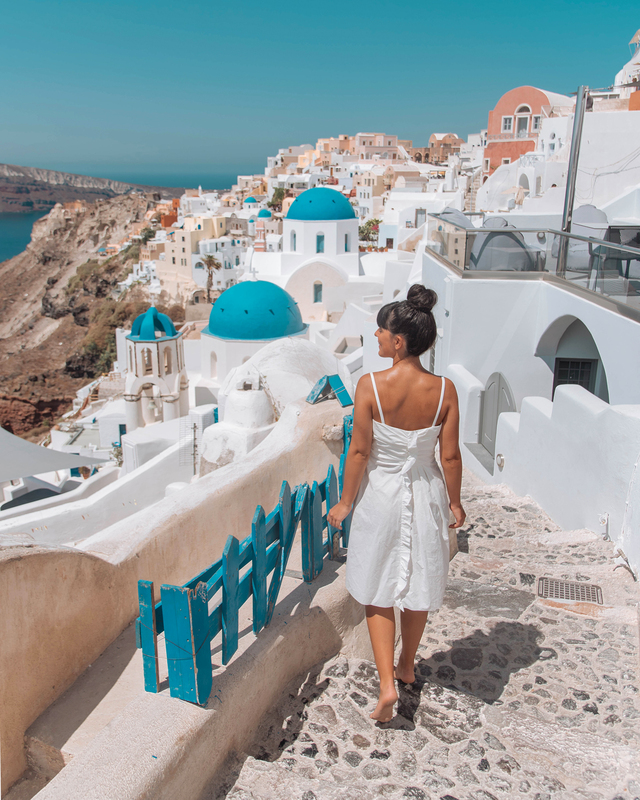 How to reach Oia Santorini. I bought the flight tickets, as always, on SkyScanner. After comparing the prices and checking the schedules that were more congenial to me, I bought them directly from the website as I was at the computer at the time, otherwise, if I’m away from home, I use their app. The flights to Santorini, it must be said, have bad times: the day of departure and of arrival are lost. To save time I chose the option of Aegean Airlines with a stopover in Athens, which allowed us to delay the return for a couple of hours: instead of leaving at 11:00am we left at 13.20pm, landing in Milan Malpensa at 4.30pm. Instead, at the departure, we left from Malpensa at 17:00pm and landed in Santorini, after the short stop in Athens, around 22:30pm. We stayed 3 nights, so we were there for two days and a full morning. 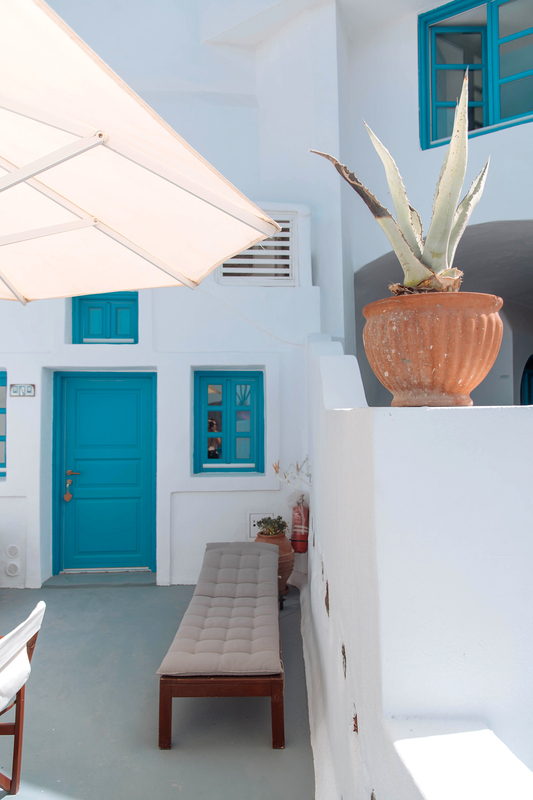 Where to stay in Oia Santorini. We stayed at Esperas Santorini Hotel, a newly opened five-star hotel, built in a truly privileged location to watch the sunset! It is located at the end of the village of Oia, just below one of the two windmills. As we were walking down there on the evening of our arrival, we immediately thought of the scene of a film released the year of our high school diploma, which we liked a lot! It’s an Italian movie called “Che ne sarà di noi” and right here, under the mill which is exactly above Esperas Santorini, they have shot a scene in which the main actress dances on the wall! We stayed in a honeymoon suite, with an incredible view of the Aegean Sea and a private jacuzzi. Inside of the suite we found a large living area with two sofas, a study area perfect for computer work (thanks to wi-fi), mini-bar and TV. Separate from two blue painted doors there were two other rooms: the bedroom with the king-size bed and the wardrobe and the marble bathroom with the shower. As I was saying before, the location of Esperas Santorini is incredible. Every evening at sunset I watched my neighbors, each on his own deck, holding their camera, ready to capture the perfect light. But no one else except us could do it directly from their own jacuzzi. Look at that suggestive sunset! 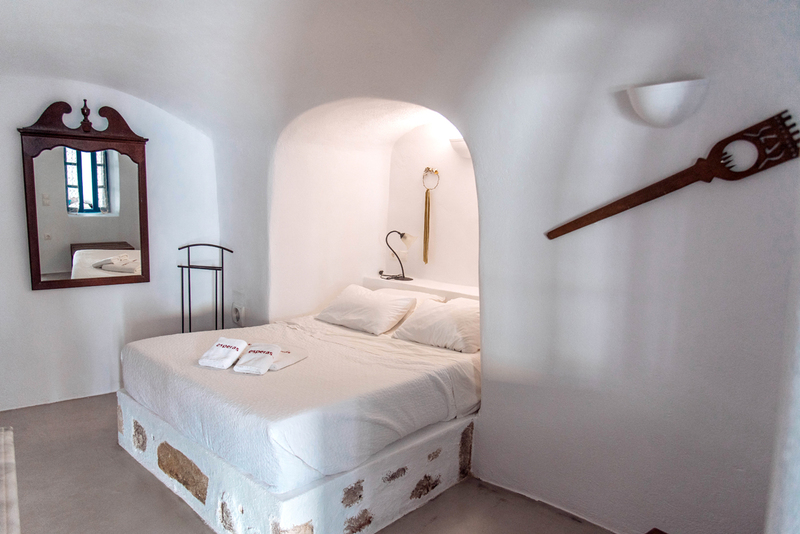 As you can see from the photos, the Esperas Santorini is entirely carved out of the rock. Our room was among the lower ones, while at the top was the swimming pool and the terrace restaurant, where we ordered their Greek salad and pita! Breakfast at Esperas Santorini is served in your room. Every evening you just have to fill out the form and leave it outside the door, to receive the breakfast perfectly on time the next morning! We have always chosen a sweet breakfast. There was a cake in particular that was really delicious, sprinkled with cinnamon: my favorite! 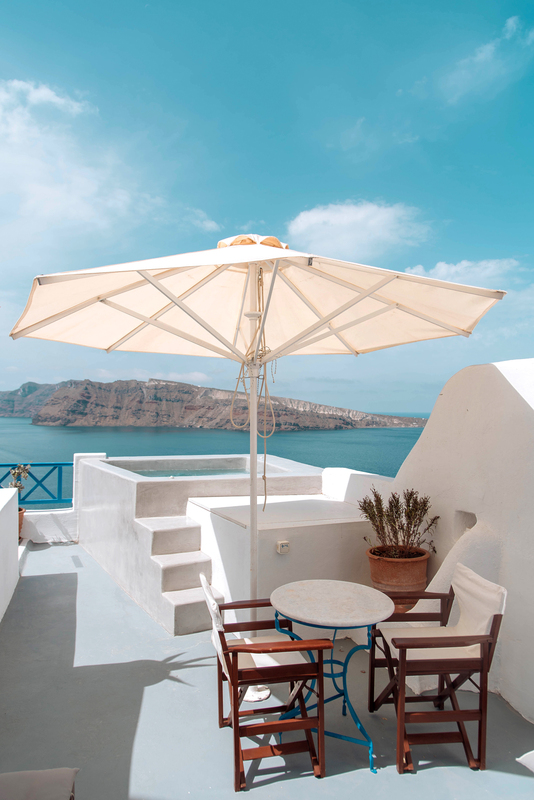 We spent a day at another resort, the Canaves Oia Luxury Suites. Another wonderful hotel, located all the other side of Oia from the Esperas, at the beginning. We had lunch in their poolside restaurant and then took advantage to get some sun on the loungers in the water! 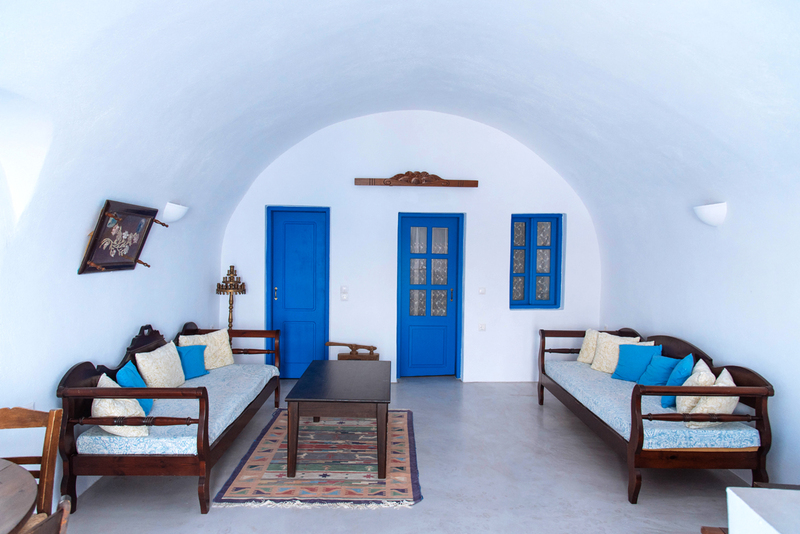 I recommend you stay in a hotel, B&B or apartment located inside the village of Oia, because it is the most beautiful. It’s also the place where you will find most of the restaurants, shops and views of Santorini. Otherwise you can just sleep outside and then rent a quad, a motorcycle or a car to get around. Last year I stayed in a beautiful hotel in Imerovigli, which was really lovely. 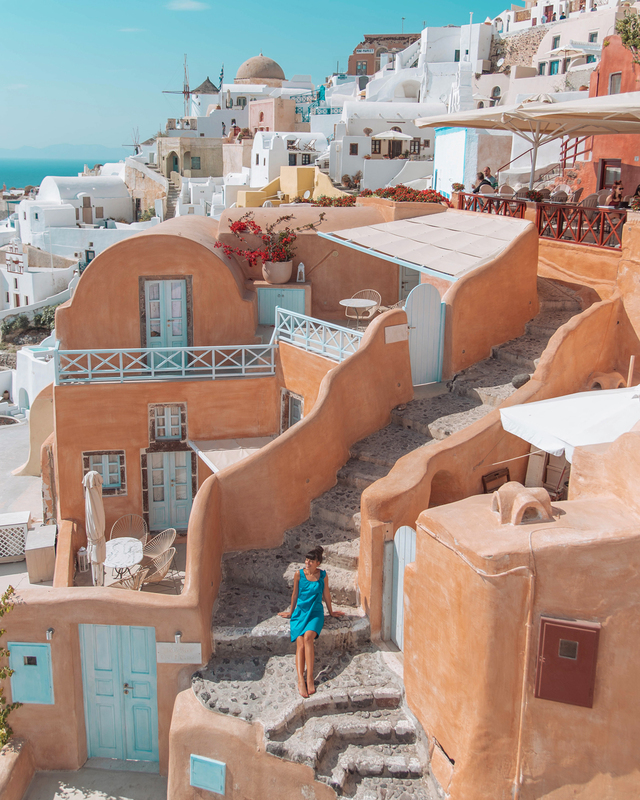 In this way you can also see the other villages like Thira, where the houses are of all pastel colors and not only white and blue. To Thira I went because it was the only place where there was (and maybe there is still) a store that sells colored balloons, which I used to make that famous photo for my birthday! You might remember it! 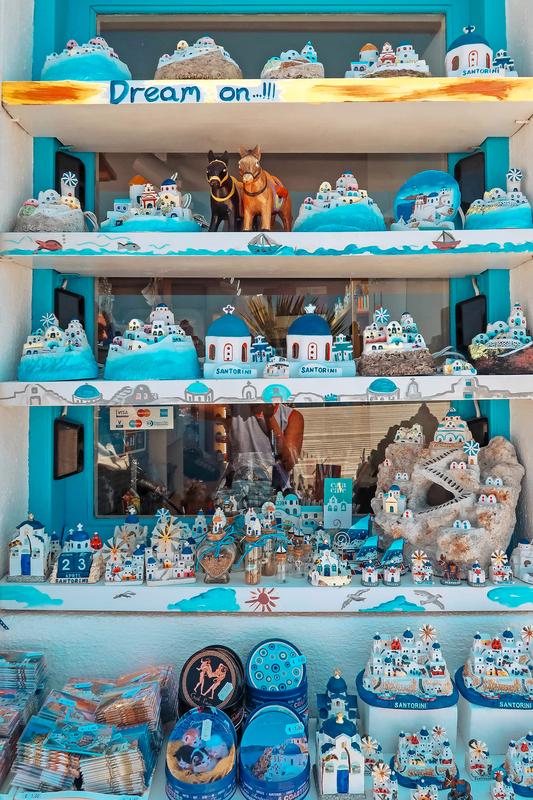 What to see in Oia Santorini. Oia is for me one of the most beautiful villages in the world. Maybe because it is perched on the calder’s edge and there are a thousand steps to take, so many beautiful corners, flowers and plants that run along the walls of the perfectly white-painted houses… But the real reason why I love it (and also why pro and amateur photographers from all over the world love it too) is because of its perfect position to admire the sun setting over the sea. The place where everyone starts meeting several hours before sunset is right in the middle of the village, where you can see below. We have been there early in the morning, preferring the sunset from the peace of our hotel room. Every glance fills your heart. And it makes you crazy for shopping: from objects to magnets, from earrings with colorful pom pom to straw hats… There is something for everyone! 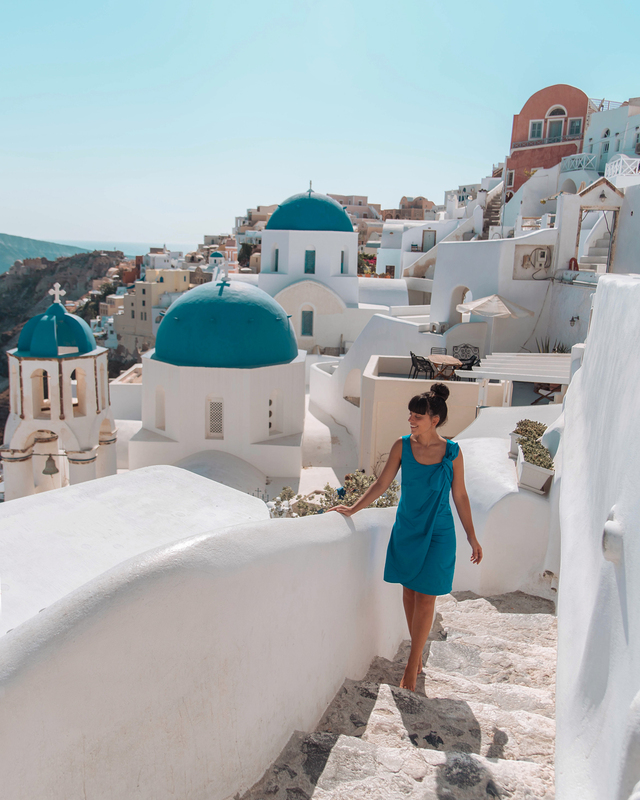 Another great iconic place of Oia are its churches with blue domes, which stand out in the immaculate white of the surrounding landscape! If you have the opportunity and time I also suggest you walk the stairs that lead down to the port and the various restaurants, including my favorite Dimitri, where I had already been last year and I could not wait to go back! You go from 250 meters above sea level to zero. Many people come down on foot and go back on board the donkeys. I’ve never done it because I don’t think it’s right and I’ve never felt the need. I do not deny that the climb is rather tiring, but it is also the descent: the steps are really many and steep, but it is something that everyone does without problems. 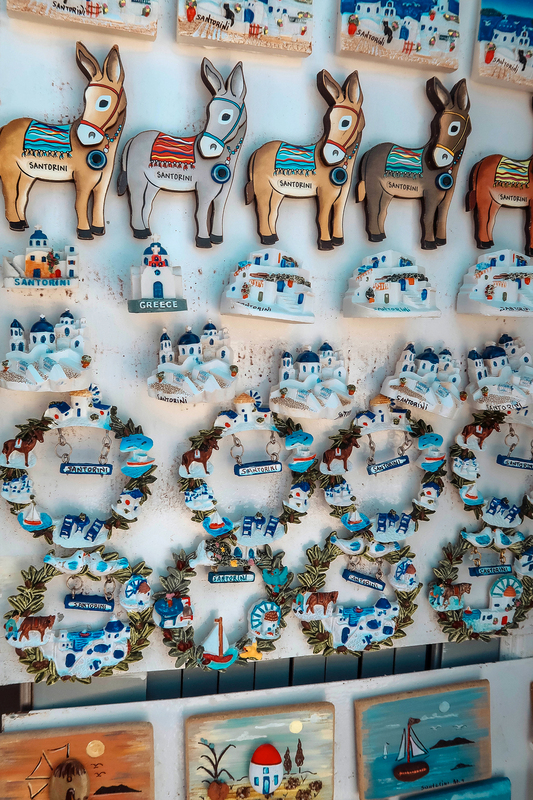 Where (and what) to eat in Oia Santorini. 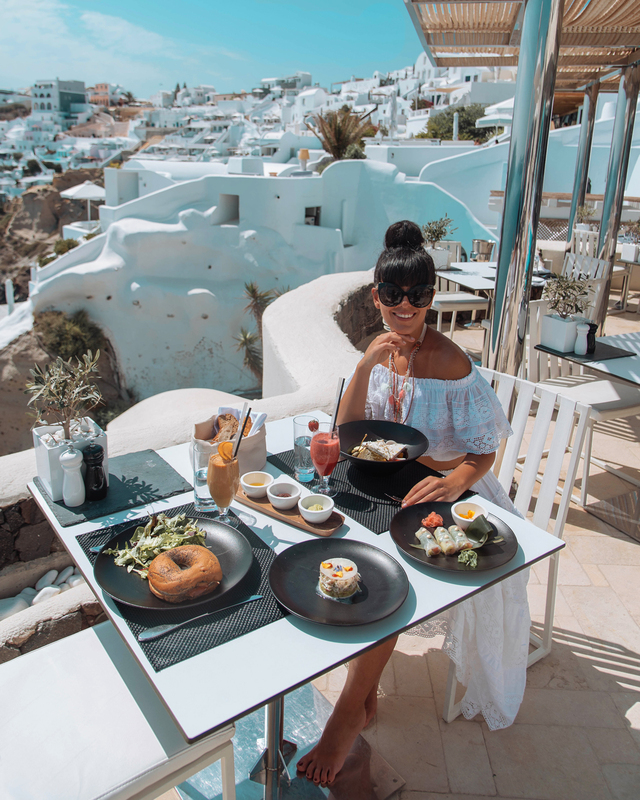 In addition to the tavern of Dimitri, where you can choose from a menu full of fresh fish of all kinds, we have always eaten at the hotel, twice at Esperas Santorini and once at Canaves Oia. For lunch we often ordered the Greek salad, made with feta, oregano, cucumber, tomatoes, olives and capers topped with flavored oil. To be served with freshly baked pita: simply delicious! Exploring Santorini beaches. 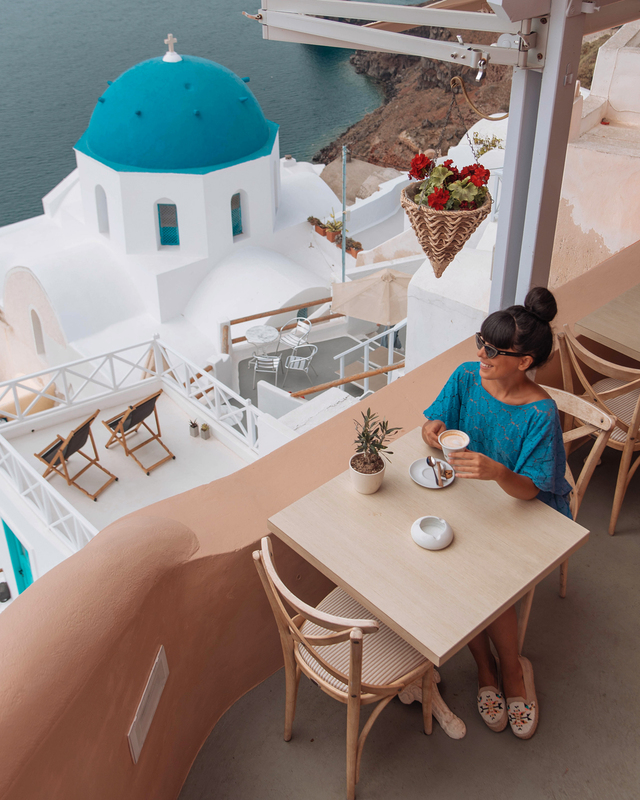 I must say that we went to Santorini for work, because we had to shoot some projects in Oia so we had neither the opportunity nor the time to get around the island. Secondly, Santorini is a large island of volcanic origin, so the beaches are definitely not its strong point. There are only a couple of them: the red beach, which has now collapsed and is closed, and the black beach (because of the lava), but are not to be missed in my opinion. They are about an hour’s drive from Oia, so you need a way to get there and time to do it. I had already seen them last year when I had done a katamaran cruise with Sunset Oia Sailing, which I recommend a lot (discover all the details in a blog post you can read HERE)! If you want to have a day by the sea, surely the cruise is the best solution and you can swim in the wonderful waters of the Aegean! If you have time, you can also visit the islands near Santorini, which can be easily reached by ferry-boat. In just a couple of hours you will reach Mykonos and in much less the nearest Ios! Thus ends my travel diary of 3 days in Santorini! I wish you all a wonderful Thursday!